Tis the season for weddings and last week Michael and I attended one for our nephew who’s starting a beautiful new phase of his life. I smiled as I watched their ceremony, recalling the sweet memory of our own wedding day and the vows we wrote for each other. Nothing has forced me to grow more than my marriage to Michael. And nothing has brought me more meaning, joy and fulfillment. First and foremost, I’d vow to do my best to remember that marriage is a spiritual partnership designed to teach us about love – how to love each other and ourselves – so we can share this love with the world. I’d promise to keep this higher vision of partnership in mind, especially when things get hard. I’d promise to create a habit of remembering five things I love about Michael before entering into scary and hard conversations that are sure to push buttons. I’d commit to always look for the role I play in any mess we happen to find ourselves in, and be willing to do what it takes to heal myself so I can change my behavior and become a more loving and respectful partner. 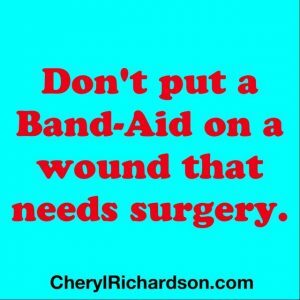 This healing work is rarely done alone, so I’d also commit to getting whatever help we need. I’d vow to look for things, big and small, to appreciate about Michael every day – and to share this information with him because I’ve learned that people grow with love and appreciation, not criticism and nastiness. If the idea of apologizing even when you think you’re right seems crazy, please go back to the first vow . After all, the evolution of any relationship requires regular upgrades to Love’s operating system . Remember the couples talking about marriage after the movie, When Harry Met Sally? Watch it, here.